CHICAGO – I’ve done hundreds of interviews and rarely felt more like I was talking to an actor at a career turning point than when I sat with Jonah Hill of “Moneyball” last week. Having spoken to him at his first career turning point for a “Superbad” interview, it was fascinating to see how he’s changed and matured. He’s keenly aware of what this already-critically-acclaimed film could (and likely will) do for him. 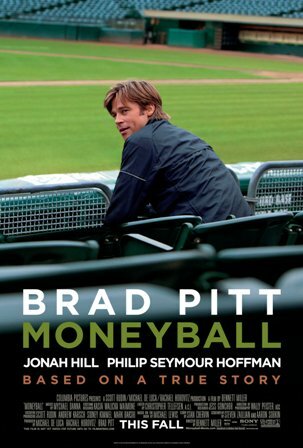 Starring opposite Brad Pitt in the stellar drama about Billy Beane’s attempt to redefine what makes a successful baseball team, Hill has taken his first chance at drama and absolutely delivered. He’s humble, modest, and even emotional about where he’s at in his career and my only regret about the interview was that it wasn’t twice as long. As I was walking into the room at the Four Seasons, the Detroit Tigers had just won their 12th game in a row, making a run at the historic winning streak of the Oakland A’s that plays a major role in “Moneyball.” And, to top it off, Hill had thrown out the first pitch that afternoon for the Sox-Tigers game that Detroit had just taken in extra innings. As with a lot of things with Mr. Hill, things seemed to be happening at the right time and in the right place. HollywoodChicago.com: Hope the Tigers keep that up. It will be good for the movie. 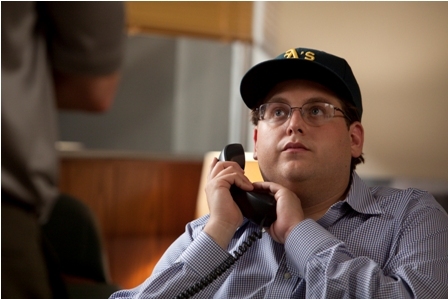 JONAH HILL: Well, no, we want the A’s to keep the record. HollywoodChicago.com: Think about it. If the Tigers keep it up, every time ESPN mentions it, they’ll say “Like the A’s, now featured in Moneyball.” [Jonah laughs.] Free promotion! 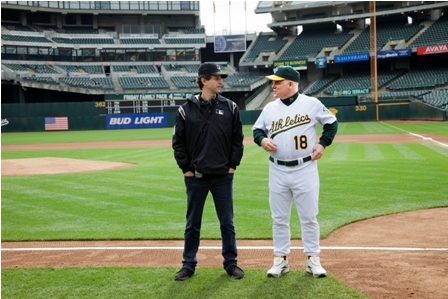 Were you nervous about throwing out the first pitch today? HILL: No, I had done it before at Fenway. HollywoodChicago.com: Were you nervous about that one? HILL: Yes. I practiced for like a month. HILL: But when you’ve got a cannon like this attached to your body it can be hard to feel nerves. HollywoodChicago.com: You got a good arm? HILL: Broke the guy’s hand. He was rushed to the hospital. HollywoodChicago.com: Right, right. I saw that on the news. HILL: I think his hand fell off. HollywoodChicago.com: Where’d you do it from? HILL: On the MOUND. Come on, my man. HollywoodChicago.com: Sorry, sorry. Of course. You’ve had a long day — Q&A last night, chatting up journalists, breaking hands, flying to Dallas tonight. It’s got to be tiring to a certain extent. You can be honest. HILL: I’m physically tired. But I’m not upset. I’m so overjoyed to be a part of this movie. The whole thing feels like a very surreal dream. I can’t believe I’m here. HollywoodChicago.com: That was a true story. HILL: [Laughs.] Yeah. Another true story about baseball. 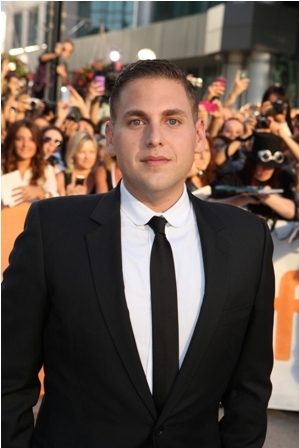 Then I was saying “Hey, I’m Jonah and I’m in this comedy film and would like to make other comedy films. Please accept me.” And, now, years later I’ve grown up and matured and I’m saying, “I’m Jonah and now I’m in this totally different kind of movie from what you’ve seen me in. I’d like to make more drama films. Please accept me.” I’m proving myself once again. I’m trying to prove myself to people who aren’t sure. There’s a question mark. HollywoodChicago.com: Did you honestly have doubt you would do drama? HollywoodChicago.com: Because you weren’t offered them? HILL: Thank you. I’m really proud of that movie. To me, it was the perfect bridge between comedies and dramas. 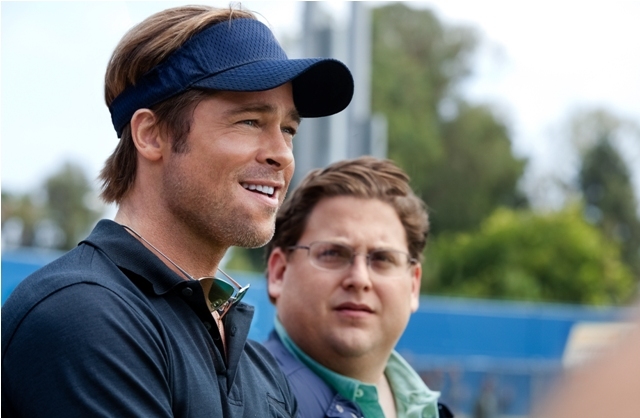 If I had done “Moneyball” straight after a comedy it might have been a little jarring. “Cyrus” was funny and dark. HollywoodChicago.com: I wasn’t surprised to see you in a drama. So, I’m a little surprised there was doubt. HILL: Not doubt that I COULD do it. Doubt that people would let me. And then once they let you it’s nerve-wracking — will people accept it? HollywoodChicago.com: Well, now that they have? I mean, you must know the positive buzz out of Toronto, right? It was incredible. Do you pay attention to that kind of stuff? Read reviews? HILL: What’s good is that I’m so busy that I don’t know. I don’t have time even to look at a computer. It’s to the airport to the hotel to the interview to the airport. That’s kinda good. I could become obsessive if I was at home. I feel bad for Bennett because he’s not on tour. If I was home alone for the next few weeks, I’d be on the Internet constantly. HILL: Did they say that?!?! Wow. Whoa. [Seems shaken up by the news with his head in his hands.] Wow. This is so f**king surreal, dude. It’s a nice thing. HollywoodChicago.com: It clearly means something to you. HILL: It’s really emotional and special. The Toronto premiere was, hands-down, the most dream-like moment of my life. I was there with Bennett and Brad and myself and we got a standing ovation from 2,500 people and I broke down like a baby. My parents and friends were there. I took one look at my friends and was uncontrollably crying. It’s just crazy. The whole thing. HollywoodChicago.com: But you had seen the movie and had to be proud of what you had accomplished in it. HILL: Oh yeah. Very proud. HollywoodChicago.com: So, let’s say that audiences and critics don’t respond. Would that have made it any less of an accomplishment for you? HILL: No. “Cyrus” was pretty critically acclaimed but no one saw it, on the grand scale of things. And it doesn’t diminish my pride in that film one iota. HollywoodChicago.com: It’s just the cherry. HILL: Yeah. I know I can show my grandkids “Cyrus” and say, “This is what I did. I’m proud of this movie and I worked hard on it.” When everyone else likes it, it’s icing on the cake. For this, I don’t know. I just really hope they let me make more dramas. HollywoodChicago.com: I wouldn’t worry about that at all. Not only because of my opinion but what others are already writing. We’re touching on something a bit that always interests me. Matthew Goode told me a few years ago that he likes to think of every film as a learning experience — So, what did we learn making “Moneyball”? Sounds like there’s a lot. HILL: That’s absolutely true, by the way. I got really lucky to come up and be mentored by Judd Apatow. At that time, he always had like three or four movies in production. Usually, I was acting in one of them and then on set just learning and watching people. On “Pineapple Express,” I was unemployed and just there every day watching what everyone was doing. On this film, you couldn’t find a person on the set who wasn’t THE BEST in the industry at what they do. Whether it was Wally Pfister (cinematographer) or our sound department or props — they were literally THE BEST at what they do in the business. HollywoodChicago.com: Even Mychael [Danna]’s score. HILL: Which is great. Oh my God. And Bennett’s so elegant with it. So minimal. They don’t over-use it. It’s so powerful. HollywoodChicago.com: I love how he lets the whole thing breathe. A lot of directors would have made a 90-minute version of this film but he lets it take time. HILL: He’s ballsy. The amount of quiet in this film is a bold statement. Bennett is in a class by himself. In that game, there’s no sound for a full minute. Bennett said when we were making movie, “Are you happy you’re here?” And I said, “I’m SO happy, SO excited.” We were friends before the film and he knew how much I wanted this. But I said, “I want to do drama, but I got to tell you man, there’s kind of nothing cooler than standing in the back of a crowd and watching a comedy annihilate.” He goes, “Well, there’s one thing better than that: Sitting in a room full of people with their elbows on their knees in complete silence, waiting to see what happens next.” I didn’t understand it at the time. When 2,500 people were silent in Toronto, I understood. HollywoodChicago.com: I want to go back a beat real quick. You talk about being mentored by Judd with his 3-4 movies at a time. You work SO often, making 2-3 movies a year on average. Do you think that ethic comes from your time with Judd? Things always need to be moving and going? HILL: Judd, Seth [Rogen], my parents. My parents are very hard-working people. It’s a hard-working family. My mom and dad the most and then Judd & Seth. Everyone I’ve respected and worked around works insanely hard. I don’t think opportunity should be wasted. I know how lucky I am. After “Superbad,” I was nervous. And I slowed down a bit. I auditioned to be a writer for “Bruno” and was a writer/producer on that film. I always wanted to be furthering myself even if it wasn’t acting. I jumped into a writer’s room after my breakthrough and continued wanting to learn from Sacha [Baron Cohen]. I was so happy to be there. HILL: …a bunch of bad movies. HollywoodChicago.com: A BUNCH of bad movies. HILL: What’s interesting is that I’ve grown up and matured in front of the public eye. When I read interviews from when we first talked, I cringe. HollywoodChicago.com: It wasn’t that bad. I read it again today. HollywoodChicago.com: Seriously. It wasn’t bad. HILL: Still, most people don’t want a snapshot at an immature age for everyone to reference. HollywoodChicago.com: I can’t imagine if I did an interview when I was 22. HILL: I was an idiot. I thought I knew everything about the universe and I knew nothing. I wanted so badly to be respected and seen as mature. The truth is that it comes with experience. Now that I’m almost 30, I’m still learning every day. It’s a bizarre thing. I really do feel like it’s my second time around right now. HollywoodChicago.com: As someone who’s ten years older, I can tell you that you’ll have a 3rd and a 4th time as well. Don’t lose that desire to keep learning and changing. HILL: I appreciate that. The second you stop progressing, you’ve given up — as personal growth and creative growth. 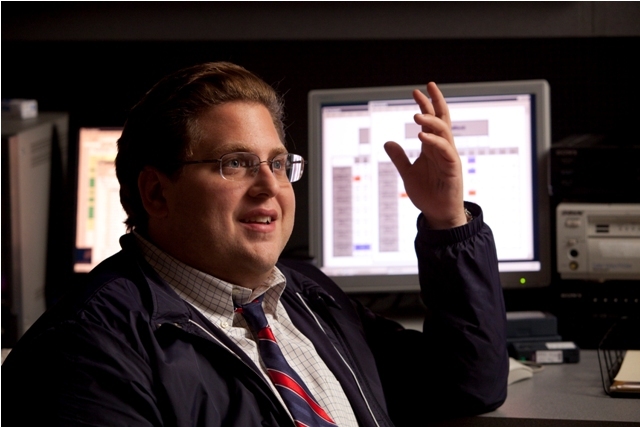 Watch the personal and creative growth of Jonah Hill in “Moneyball,” opening nationwide on September 23rd, 2011.